1 oz Gold Bars. 1 oz lot of 20. 1 oz lot of 25. 1 oz lot of 100. 1 oz lot of 500. 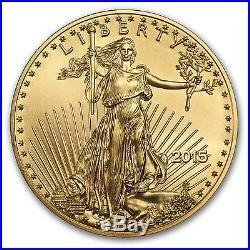 2015 1/4 oz Gold American Eagle BU – SKU #84885. Gold American Eagles are the ideal mixture of American history and nostalgia with modern Gold bullion investment value, making them valuable to both collectors and investors alike. Contains 1/4 oz actual Gold weight. Multiples of 40 are packaged in mint tubes. All other coins will be in protective plastic flips. Obverse: Adapted from Augustus Saint-Gaudens’ famed 1907 Gold Double Eagle design, which features Lady Liberty walking confidently against the sun’s rays. Reverse: Designed by Miley Busiek, the reverse shows a male bald eagle in flight carrying an olive branch to his nest, where a female awaits with her young. 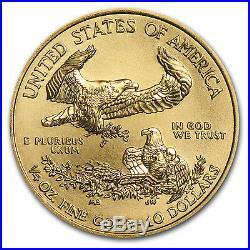 Minted at West Point, N. Fractional Gold Eagles allow for ownership of a classic American design with investment appeal at a lower price point. Add this 2015 1/4 oz Gold Eagle to your cart today! Each package is fully insured. There are no exceptions to this rule. The UPS Store, or similar third party drop off locations. If you do not receive the package directly from the common carrier, you agree to take all reasonable actions to assist in recovery of the package, including but not limited to filling out reports (and/or police reports) and providing all information needed or that may be requested to assist in recovery of the package. We may ask you to file a police report if it appears loss is due to theft or tampering. Your assistance speeds up the investigation and the sooner we complete it, the sooner we can resolve the missing order. If we determine the package is lost or damaged, we file a claim. Failure to fully cooperate will jeopardize coverage that may be provided to you. For approved exchanges, you must follow all instructions provided by Customer Service, including carefully packaging the Product. Prices Q: How often are prices updated? Our listings remain live while pricing updates so you don’t have to worry about listings being removed and reposted. Orders Q: Is there a minimum order amount? Orders of all dollar amounts are welcome. Q: Can I change my order once it’s placed? A: Processing begins immediately upon completion therefore changes cannot be accepted. Q: Can I cancel my order? A: Once your order is completed it cannot be cancelled. Please be certain of your order before finalizing. A: Oklahoma City, Oklahoma. Q: Is my package insured while in transit? Additionally, if a package is signed for by the apartment/complex building management, we do not assume responsibility. Q: What do I do when my package appears to be lost? There are no added commissions. Back Ordered Items Supply and demand problems occasionally occur in our business. From time to time, we have more buyers than sellers. If your Order(s) is cancelled, you agree you have full responsibility and liability to APMEX for any Market Loss. Pricing or Typographical Errors We work hard to provide accurate Product and pricing information to you. However, pricing or typographical errors may occur. Prices and availability are subject to change without notice. Risks All investments involve risk; Coins and Bullion are no exception. The value of a Bullion Coin e. American Eagles or Canadian Maple Leafs is affected by many economic factors, including the current market price of Bullion, the perceived scarcity of the Coins and other factors. Some of these factors include the quality, and current demand and general market sentiment. Therefore, because both Bullion and Coins can go down in price as well as up, investing in them may not be suitable for everyone. Because all investments, including Bullion and Coins, can decline in value, you should understand them well, and have adequate cash reserves and disposable income before considering a Bullion or Coin investment. Please consult your financial advisor. APMEX does guarantee that every item that we sell is genuine and that all Precious Metal items do contain the weight, fineness, and purity that we have advertised. However, all investments, of every type, involve some level of risk and Precious Metals are no exception. Like many markets, the Precious Metals market is speculative, and it is unregulated. The value of any Bullion item is generally determined by current spot price of the underlying Precious Metal and by the supply and demand for these particular items. These prices will fluctuate throughout the day while the Precious Metals market is open. If you are considering purchasing Precious Metals as an investment, you should assess the stability of the current market and contact your financial advisor for all advice. Definitions The following terms have the following meanings in these T&C: 1. The term “APMEX” means APMEX, Inc. The term “Bullion” is used to describe (1) Gold, Silver, Platinum or Palladium Coin(s) which closely follow spot prices and have little or no Numismatic value (such as restrikes); and (2) the form in which metal is shaped such as bars, ingots or wafers. The term “Coin(s)” means a stamped piece of metal of a known weight and fineness issued for commerce by a sovereign government. The term “Fair Market Value” means the Fair Market Value of the Product as determined by APMEX, in its reasonable discretion, as of 5:00 p. The term “Numismatic Coin(s)” means a Coin, the price of which depends more in its (their) rarity, condition, dates, and mint marks than on their gold or silver content, if any. The term “Precious Metal” means Gold, Silver and Platinum along with the Platinum group of elements: rhodium, osmium, ruthenium, Palladium and iridium. Precious Metals are characteristically lustrous, ductile, rare and nonreactive. The term “Semi-Numismatic” means a Coin that has both Bullion and Numismatic value. General Absence of Relationship. No other relationship, including, without limitation, any agent-principal relationship, any employee-employer relationship, any franchisee-franchisor relationship, any joint venture relationship or any partnership relationship, between APMEX and you exists. You may not assign any of your rights or obligations under these T&C without the prior written consent of APMEX, which may be granted or withheld by APMEX in its sole discretion. This contract, including but not limited to the T&C, shall be binding on all permitted assigns and successors of APMEX and you. It is APMEX’s goal that any disagreement or dispute be resolved expeditiously. If an amicable resolution cannot be reached, you agree that any and all disagreements and disputes between us shall be resolved in accordance with the following paragraphs: (a) Forum Selection and Governing Law. All such disputes shall be resolved exclusively in such federal and state courts, as appropriate, in that jurisdiction. You hereby consent to personal jurisdiction and venue in those federal and state courts for the purpose of resolving any disagreements or disputes between us and waive all objections to the jurisdiction of such federal and state courts. Any action arising out of or relating to these T&C shall be governed by, and interpreted in accordance with, the laws of the State of Oklahoma, without regard to conflict of laws principles. (b) Waiver of Jury Trial; Arbitration. If APMEX cannot perform any obligation hereunder as a result of any event that is beyond its control, APMEX’s delay or failure to perform such obligation shall be excused and APMEX shall not be liable for any damages as a result of, or in connection with, such delay or such failure. You shall execute and deliver such other documents and take such other actions as may be reasonably requested by APMEX to carry out your obligations under these T&C. Except as otherwise provided herein, all notices and other communications to APMEX shall be directed to APMEX, c/o Chief Financial Officer, 226 Dean A. McGee Avenue Oklahoma City, OK 73102, and all other notices and other communications to you shall be directed, at the option of APMEX, to the address that you provided to APMEX at the time of your registration. A decision or a failure by APMEX to take action with respect to any non-compliance by you of your obligations to APMEX or to insist upon strict adherence to any term in these T&C, does not affect the ability of APMEX with respect to any other non-compliance by you, and does not waive or limit APMEX’s right thereafter to insist upon strict adherence to that or any other term, whether of a similar or dissimilar nature. The section headings are included for ease of reference and do not affect the interpretation or the scope of these T&C. These T&C are intended to be enforceable to the fullest extent permitted by applicable law. If any term of these T&C is held to be unenforceable for any reason, such unenforceability shall not affect the other terms of these T&C, and the term that would otherwise be unenforceable shall be enforced to the fullest extent that it would be enforceable. APMEX may amend these T&C at any time by posting the amended terms on the website, and such amendments shall become effective immediately. If you become aware that you may be required to make any disclosure of such information, including, without limitation, as a result of the receipt of a subpoena or other compulsory process, you shall promptly notify, in writing, APMEX and you shall cooperate, in good faith, with APMEX in obtaining a protective order or other appropriate relief, if any, with respect to such disclosure. The item “2015 1/4 oz Gold American Eagle BU SKU #84885″ is in sale since Thursday, January 8, 2015. This item is in the category “Coins & Paper Money\Bullion\Gold\Coins”. The seller is “apmex” and is located in United States. This item can be shipped worldwide. 1 oz Gold Bars. 1 oz lot of 20. 1 oz lot of 25. 1 oz lot of 100. 1 oz lot of 500. 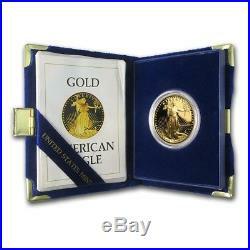 1 oz Proof Gold American Eagle (Random Year, w/Box & COA) – SKU #59248. The 1 oz Gold American Eagle is the most popular Gold bullion coin in the United States, and also one of the most beautiful. Its classic obverse design features Lady Liberty walking confidently against the sun’s rays, while a family of American eagles appears on the reverse. Minted at West Point, N. And guaranteed by the U. Each Proof Gold Eagle coin comes to you in a box with certificate of authenticity. Date(s) on Random Year coins may or may not vary, determined by stock on hand. Each package is fully insured. There are no exceptions to this rule. The UPS Store, or similar third party drop off locations. If you do not receive the package directly from the common carrier, you agree to take all reasonable actions to assist in recovery of the package, including but not limited to filling out reports (and/or police reports) and providing all information needed or that may be requested to assist in recovery of the package. We may ask you to file a police report if it appears loss is due to theft or tampering. Your assistance speeds up the investigation and the sooner we complete it, the sooner we can resolve the missing order. If we determine the package is lost or damaged, we file a claim. Failure to fully cooperate will jeopardize coverage that may be provided to you. For approved exchanges, you must follow all instructions provided by Customer Service, including carefully packaging the Product. Prices Q: How often are prices updated? Our listings remain live while pricing updates so you don’t have to worry about listings being removed and reposted. Orders Q: Is there a minimum order amount? Orders of all dollar amounts are welcome. Q: Can I change my order once it’s placed? A: Processing begins immediately upon completion therefore changes cannot be accepted. Q: Can I cancel my order? A: Once your order is completed it cannot be cancelled. Please be certain of your order before finalizing. A: Oklahoma City, Oklahoma. Q: Is my package insured while in transit? Additionally, if a package is signed for by the apartment/complex building management, we do not assume responsibility. Q: What do I do when my package appears to be lost? There are no added commissions. Back Ordered Items Supply and demand problems occasionally occur in our business. From time to time, we have more buyers than sellers. If your Order(s) is cancelled, you agree you have full responsibility and liability to APMEX for any Market Loss. Pricing or Typographical Errors We work hard to provide accurate Product and pricing information to you. However, pricing or typographical errors may occur. Prices and availability are subject to change without notice. Risks All investments involve risk; Coins and Bullion are no exception. The value of a Bullion Coin e. American Eagles or Canadian Maple Leafs is affected by many economic factors, including the current market price of Bullion, the perceived scarcity of the Coins and other factors. Some of these factors include the quality, and current demand and general market sentiment. Therefore, because both Bullion and Coins can go down in price as well as up, investing in them may not be suitable for everyone. Because all investments, including Bullion and Coins, can decline in value, you should understand them well, and have adequate cash reserves and disposable income before considering a Bullion or Coin investment. Please consult your financial advisor. APMEX does guarantee that every item that we sell is genuine and that all Precious Metal items do contain the weight, fineness, and purity that we have advertised. However, all investments, of every type, involve some level of risk and Precious Metals are no exception. Like many markets, the Precious Metals market is speculative, and it is unregulated. The value of any Bullion item is generally determined by current spot price of the underlying Precious Metal and by the supply and demand for these particular items. These prices will fluctuate throughout the day while the Precious Metals market is open. If you are considering purchasing Precious Metals as an investment, you should assess the stability of the current market and contact your financial advisor for all advice. Definitions The following terms have the following meanings in these T&C: 1. The term “APMEX” means APMEX, Inc. The term “Bullion” is used to describe (1) Gold, Silver, Platinum or Palladium Coin(s) which closely follow spot prices and have little or no Numismatic value (such as restrikes); and (2) the form in which metal is shaped such as bars, ingots or wafers. The term “Coin(s)” means a stamped piece of metal of a known weight and fineness issued for commerce by a sovereign government. The term “Fair Market Value” means the Fair Market Value of the Product as determined by APMEX, in its reasonable discretion, as of 5:00 p. The term “Numismatic Coin(s)” means a Coin, the price of which depends more in its (their) rarity, condition, dates, and mint marks than on their gold or silver content, if any. The term “Precious Metal” means Gold, Silver and Platinum along with the Platinum group of elements: rhodium, osmium, ruthenium, Palladium and iridium. Precious Metals are characteristically lustrous, ductile, rare and nonreactive. The term “Semi-Numismatic” means a Coin that has both Bullion and Numismatic value. General Absence of Relationship. No other relationship, including, without limitation, any agent-principal relationship, any employee-employer relationship, any franchisee-franchisor relationship, any joint venture relationship or any partnership relationship, between APMEX and you exists. You may not assign any of your rights or obligations under these T&C without the prior written consent of APMEX, which may be granted or withheld by APMEX in its sole discretion. This contract, including but not limited to the T&C, shall be binding on all permitted assigns and successors of APMEX and you. It is APMEX’s goal that any disagreement or dispute be resolved expeditiously. If an amicable resolution cannot be reached, you agree that any and all disagreements and disputes between us shall be resolved in accordance with the following paragraphs: (a) Forum Selection and Governing Law. All such disputes shall be resolved exclusively in such federal and state courts, as appropriate, in that jurisdiction. You hereby consent to personal jurisdiction and venue in those federal and state courts for the purpose of resolving any disagreements or disputes between us and waive all objections to the jurisdiction of such federal and state courts. Any action arising out of or relating to these T&C shall be governed by, and interpreted in accordance with, the laws of the State of Oklahoma, without regard to conflict of laws principles. (b) Waiver of Jury Trial; Arbitration. If APMEX cannot perform any obligation hereunder as a result of any event that is beyond its control, APMEX’s delay or failure to perform such obligation shall be excused and APMEX shall not be liable for any damages as a result of, or in connection with, such delay or such failure. You shall execute and deliver such other documents and take such other actions as may be reasonably requested by APMEX to carry out your obligations under these T&C. Except as otherwise provided herein, all notices and other communications to APMEX shall be directed to APMEX, c/o Chief Financial Officer, 226 Dean A. McGee Avenue Oklahoma City, OK 73102, and all other notices and other communications to you shall be directed, at the option of APMEX, to the address that you provided to APMEX at the time of your registration. A decision or a failure by APMEX to take action with respect to any non-compliance by you of your obligations to APMEX or to insist upon strict adherence to any term in these T&C, does not affect the ability of APMEX with respect to any other non-compliance by you, and does not waive or limit APMEX’s right thereafter to insist upon strict adherence to that or any other term, whether of a similar or dissimilar nature. The section headings are included for ease of reference and do not affect the interpretation or the scope of these T&C. These T&C are intended to be enforceable to the fullest extent permitted by applicable law. If any term of these T&C is held to be unenforceable for any reason, such unenforceability shall not affect the other terms of these T&C, and the term that would otherwise be unenforceable shall be enforced to the fullest extent that it would be enforceable. APMEX may amend these T&C at any time by posting the amended terms on the website, and such amendments shall become effective immediately. If you become aware that you may be required to make any disclosure of such information, including, without limitation, as a result of the receipt of a subpoena or other compulsory process, you shall promptly notify, in writing, APMEX and you shall cooperate, in good faith, with APMEX in obtaining a protective order or other appropriate relief, if any, with respect to such disclosure. The item “1 oz Proof Gold American Eagle (Random Year, withBox & COA) SKU #59248″ is in sale since Wednesday, December 9, 2015. This item is in the category “Coins & Paper Money\Bullion\Gold\Coins”. The seller is “apmex” and is located in United States. This item can be shipped worldwide.